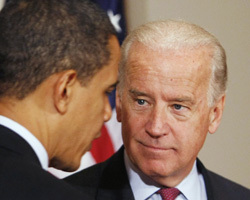 U.S. Vice President Joseph Biden, right, and President Barack Obama. So far, the program has produced 80 graduates divided into two 40-student classes. A third class, made up of commanders from the Palestinian National Security – the largest security force with 15,000 members, tasked with policing borders, providing military intelligence, military police services and presidential security – is currently being trained in Jordan.